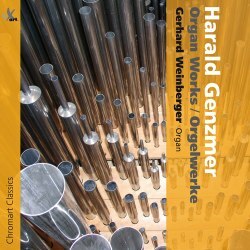 There isn’t a great deal of Harald Genzmer on recordings, but I remember being inspired by the refreshing lack of pretension in his Organ Concerto via a BBC Radio 3 broadcast many years ago. This work appears on a box set from the Thorofon label (see review) which appears to be the principal resource for collectors. Making a re-acquaintance with Genzemer’s idiom through this admirably performed and recorded selection of organ works has proved highly rewarding. Gerhard Weinberger has given première performances of Genzmer’s work, and his recordings of J.S. Bach’s organ works (see review) are also well worth having, his name a seal of quality when exploring this kind of new repertoire. The ornamented octaves which open the Festive Prelude are as good a declaration of intent as any I can think of for a one-man organ show, and this piece has plenty of content to make its duration nothing less than a joy from beginning to end. The stylistic connection with Hindemith cannot and should not be ignored, but Genzmer has a more playful side which gives his music a juicy, satisfying quality which also puts me in mind of someone like Frank Martin. The Easter Concerto is the last of four organ concertos connected with the church year, and its narrative content implies and results in some serious drama. Genzmer’s treatment of dissonance is of the kind which always strives towards resolution and his melodic shapes revolve around tonality, but his resistance to intense chromaticism and his more frequently sparing textures prevent the music becoming turgid. Counterpoint is another technique returned to in these pieces, but used one feels in service of musical expression rather than as an academic fall-back, interpolating chorale tunes in ways which build on and extend noble traditions. After a subtly atmospheric Meditation on the burial of Jesus, the Finale is the kind of lively resurrection which makes you want to join in and be part of the action. The two biblical concertos on this recording are separated by the Finale (Fantasy on the Chorale “Hinunter ist der Sonne Schein”), which is another piece filled with striking effects and masses of contrasting content. I doff my hat in respect to anyone who can produce such quality at the age of 90. Joining the Easter Concerto, the Pentecost Concerto is another very fine work, Genzmer’s musical language in the 1970s every bit as sophisticated as in later years, though perhaps leaning on some layering effects and harmonic gestures which seem a touch more predictable than with the other works on this programme. Chorales including the well-known “Nun bitten wir den heiligen Geist” are incorporated, emerging from darker shades to sum up a statement with an unmistakably positive message. The disc closes with the Symphonic Concerto No. 2, a title which points towards the grand-scale tradition of works for organ set in motion by Widor and developed by other 19th century French composers. Never entirely set free from religious associations, this work does however sometimes revel in a more virtuosic character while again steering clear of bombastic heaviness. The Adagio second movement is an object lesson in ‘less is more’, with an elegantly sparing counterpoint creating its own unique mood of meditative reflection, but the sheer sense of joy in Genzmer’s exploration of one of his favourite instruments shines though in the improvisatory freedoms which populate structure of logic and absolute intellectual control. The Finale is yet another breath of fresh air which washes over you from your speakers, the clarity and compact directness of the composer’s effortless expressiveness lifting the spirits and leaving us wanting more. Recorded on a very fine modern instrument in the rich but not overly swampy acoustic of the St. Johannes Baptist church in Paderborn-Wever, this has to be one of the best organ discs to come my way this year. Harald Genzmer is one of those ‘stop messing about and get on with it’ composers who manages to combine traditional pragmatism to a musical idiom which inspires and delights. Yes, his music is distinctively German, but in that best of ways which takes itself just seriously enough for us to sharpen our listening muscles, but with a lightness of touch which keeps us smiling. More please!